GSoC: Game script (bytecode) decompiler - First output! I finally have some actual output working. It's only a proof of concept right now, but it's a nice start. It only does these simple assignments for now - everything else is left unknown - but like I said, it's a start. 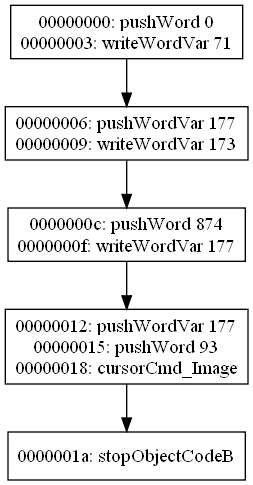 The opcodes it complains about are cursorCmd_Image and stopObjectCodeB, since I don't handle those yet.